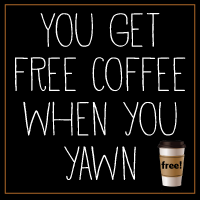 All you have to do is yawn in front of this coffee machine. Dutch coffee company, Douwe Egberts, built a coffee vending machine that detects the shape of a person's yawning face, and then dispenses a free cup of coffee. They put this machine in South Africa's O.R. Tambo International Airport as a part of a campaign, and 210 people managed to figure out that "yawning" is the key to getting free coffee. Please send this machine to America! (especially now that I know the trick).